She is accused of offending a police officer. 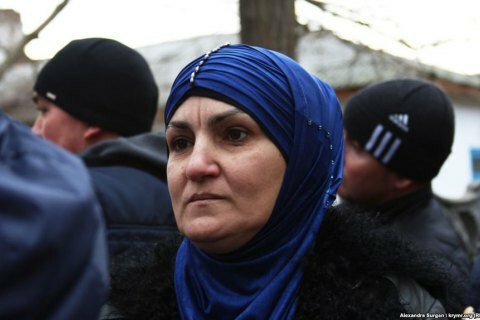 A magistrate court in the village of Kirovske in Russia-annexed Crimea has recognized Zarema Kulametova guilty of "publicly offending a representative of authority" (Article 319 of the Russian Criminal Code) and sentenced her to 250 hours of mandatory public service and a 20,000-rouble (320 dollars) fine to a police officer, according to an LB.ua correspondent. The offended official is a deputy police chief of the Russian Interior Ministry in Kirovske District, Andriy Rohozhyn. Giray Kulametov was arrested on 18 January after his home in the village of Staryy Krym was searched. For several hours, his family did not know where he had been taken. Zarema Kulametova explained that during this time she was trying to source any information from Rohozhyn. "I was extremely emotional because I thought that my son went missing. I asked Rohozhyn but he was only smirking silently. Then he started to film me on his mobile phone without my consent," she said in court. On 18 January, Giray Kulametov was found guilty of "promoting the symbols of extremist organisations" for posting a video in the Russian social network VKontakte in 2012 and sentenced him to a 10-day administrative arrest.